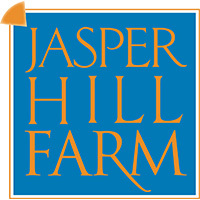 Contact Jasper Hill Farm Today! Jasper Hill is a working dairy farm with an on-site creamery in the Northeast Kingdom of Vermont. An underground aging facility maximizes the potential of cheeses made by the creamery, as well as those made by other local producers. Leftover whey from the cheesemaking process is fed to heritage breed pigs, roaming the woodlands beyond the cows' pasture. Jasper Hill's mission is to make the highest possible quality products in a way that supports Vermont's working landscape. They are driven to be the standard bearer of quality and innovation in the artisan cheese industry while promoting the regional taste of place. 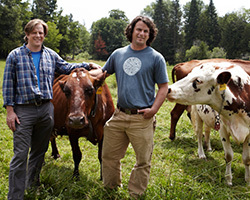 A team of brothers are proud to be the cheesemakers at Jasper Hill Farm. With a passion for fungi, Mateo works throughout the company, making and tasting cheese, solving problems, and making sure that we are staying true to our mission. When not at work, he can be found at the lake, spending time with his wife and two kids. Andy is Jasper Hill's Fire Chief, Head Plate Spinner, and Money Bags. Constantly looking for ways to improve the places around him, Andy avoids catastrophe as best as he can. He is passionate about music, community, his family, public service, and agriculture. In 2003, Cabot Creamery asked Jasper Hill Farm to age a special batch of cheddar, sparking a revolutionary collaboration. After more than a decade, the cheese has developed into the cornerstone of their collection. After it comes to the cellars, we coat the young cheese in lard and add an additional layer of cloth. The cheeses ripen in a specially calibrated vault in the cellars, where they are constantly brushed, turned, and monitored for quality. Clothbound is an approachable but complex natural-rind, bandaged cheddar with a crumbly texture and nutty aroma. The flavor is deeply savory and slightly tangy with caramel sweetness to the finish. Clothbound has a signature tang and caramel nuttiness with a rustic crystalline texture that becomes creamy on the palate. This savory-sweet balance of flavor makes a perfect match for charcuterie, apple jelly, or a rich chestnut honey. Pair with an off-dry sparkling apple cider, hoppy ale, or an oaked Cabernet Sauvignon. Bayley Hazen Blue is a Jasper Hill Farm original, and is made from their high-quality whole raw milk. It is named for an old military road commissioned by George Washington during the Revolutionary War. Though no major battle ever took place, the road brought Greensboro its first settlers and continues to be used today. Bayley has developed a loyal following because of its fudge-like texture, toasted-nut sweetness, and anise spice character. The paste is dense and creamy, with well-distributed blue veins. The usual peppery character of blue cheese is subdued, giving way to the grassy, nutty flavors in the milk. The texture and flavor make Bayley an ideal choice for any lover of blue cheese, but with a balance of flavors that renders it accessible to those new to the style. Try pairing with a fruity red dessert wine, toasty Imperial Stout, or a hunk of dark chocolate. Bayley is also ideal for crumbling over a juicy burger or adding to a salad with spinach, walnuts, and dried tart cherries. Alpha Tolman is named for a philanthropic dairy farmer who built the Greensboro library in 1900. Alpha's grandfather, Enoch, was one of the town's original settlers. His namesake cheese is made in Jasper Hill Farm's satellite creamery, located within the Vermont Food Venture Center in Hardwick, Vermont - a facility designed to incubate value-added projects and enrich our agricultural economy. Alpine cheeses like Appenzeller inspired the recipe for this Jasper Hill Creamery original. Alpha Tolman has a buttery, fruit and nut flavor when young, developing bold meaty, caramelized onion flavors as it matures. The texture is dense and pliant, easily portioned and ideal for melting. The texture, aesthetic, and flavor make Alpha Tolman an ideal choice for fans of Appenzeller (or fondue!). Try pairing with a robust ale, plummy red wine, or onion jam. For a satisfying meal, follow the lead of Swiss/French raclette - melt onto a plate of fingerling potatoes, cured meat and natural sour pickles. Harbison is named for Anne Harbison, affectionately known as the grandmother of Greensboro. Along with breathtaking views, traditions and people are part of what makes Vermont's working landscape special, and Jasper Hill Farm is proud to honor Ms. Harbison's contribution with this cheese. Harbison is a soft-ripened cheese with a rustic, bloomy rind. Young cheeses are wrapped in strips of spruce cambium, the tree's inner bark layer, harvested from the woodlands of Jasper Hill. The spoonable texture begins to develop in the vaults, though the paste continues to soften on the way to market. Harbison is woodsy and sweet, balanced with lemon, mustard, and vegetal flavors. This cheese is a great excuse to gather a few friends and scoop into a decadent treat. When a bit younger, the bark can be peeled away for sliced portioning. If the bark has fused with a more loosened paste, then the best approach is to leave the bark intact and spoon out portions from the top. Pair with oaked white wine, or barrel-aged sour beer. Fruit mostarda and crusty bread make nice accompaniments. Deb and Doub Erb craft Landaff on their second-generation dairy farm in the White Mountains. Declining milk prices drove the Erbs' determined pursuit of cheesemaking as a way to revitalize their farm. Doug developed Landaff after studying with the Vermont Institute for Artisan Cheese and making Caerphilly with the Duckett family of Somerset, England. Landaff has a natural rind and a semi-firm paste with subtle aromas of cave and grass. Its balanced complexity harmonizes a bright buttermilk tang and savory brown butter notes. Landaff is harmonic with a wide array of accompaniments - raw honey, whole-grain mustard, smoked meats, or berry preserves. Though elegant when simply paired with a sturdy white wine or crisp pilsner, Landaff is verstile enough to use in the kitchen. It melts exceptionally well, retaining a smooth body and indulgent character. Willoughby is an original creation of Marisa Mauro's Ploughgate Creamery, a Cellars collaborator that ceased production of the cheese after a creamery fire in 2011. With Marisa's blessing, Jasper Hill Farm has resurrected this pudgy little washed-rind and have continued to develop the recipe. This succulent and buttery washed-rind cheese has aromas of peat, roasted beef, and onions - a strong and complex front for the subtle milky, herbal, ripe-peach flavors within. Willoughby has a thin, tender, rosy-orange rind, which adds earthy dimension to the texture and flavors of the gooey interior. Willoughby's small format is ideal for selling whole on the retail counter, or quickly rotating through a professional kitchen. The pudding-like texture may become softer with age, but should remain sliceable for portioning until nine weeks after its production date. Pair with juicy rose, funky saison beer or raw floral honey.